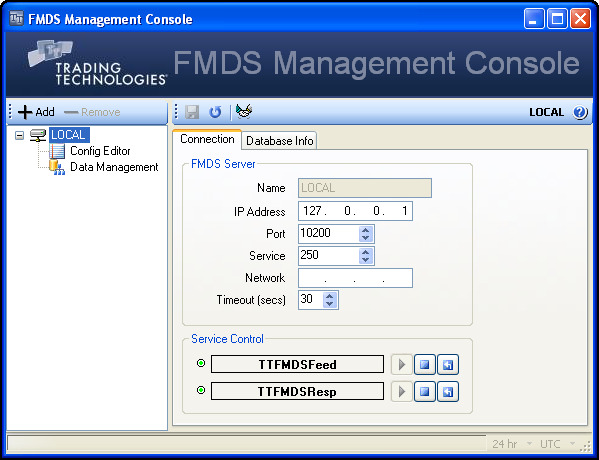 The Connection tab on the FMDS Management Console window displays all the information you need to properly manage your FMDS server. Displays the name of the FMDS server. Displays address of the FMDS server. This is normally 127.0.0.1, meaning use the local daemon through the workstation’s loopback interface. Displays the port on which TTM daemon is listening. Differentiates multiple FMDS machines within a network. This value must match the X_STUDY workstations’ Communications setting. This number must be unique in TTM domain. Differentiates multiple network interface cards (NICs) on computers with more than one, such as a firewall. It is usually empty, directing FMDS to use the primary (or only) card. Displays the time it takes FMDS to timeout due to inactivity. Lets you start, stop, and restart the TTFMDSFeed. Lets you start, stop, and restart the TTFMDSResp.